The intension of the Los Angeles City Flow Boulevard Network is, 1/ to provide a 135 mile “backbone” rapid bus transit network, 2/ to promote an increase in capacity in general to solve the vehicular congestion throughout LA, and 3/ to provide a framework for growth to occur upon it that develops the many communities into that better urban environment we all need and desire here in Los Angeles. - Look at This Plan: an affordable citywide exclusive bus lane network. What you see on the LA City Flow Boulevard Plan is the answer to building an affordable 135 mile rapid bus transit system, a backbone system that connects all other local bus routes. The necessary feature of exclusive bus lanes is what makes the buses rapid and is basic to all FB corridors. What makes the plan affordable is that the FB corridors evolve from the existing boulevards in Los Angeles. Using existing corridors also puts the rapid transit in the right place, - where people want to go-. A big network needs rapid buses. No one else, the MTA or LADOT, is planning such a system. Only the Flow Boulevard approach can bring this kind of needed system to reality in Los Angeles. Next: This rapid bus network, in combination with the improved vehicular capacity made by Flow Boulevards (FB), will solve the traffic congestion in Los Angeles including the congestion on the freeways. More can be read on the issue of making the freeway system congestion free in section FB 2006 and below. Next: In the next 30 years 1.2 million people will have obtained their desired accommodations in Los Angeles because the 500,000 additional new dwellings will have been built using the FB Network as the necessary improved transportation framework to connect them with the rest of the city. Next: The FB Network would make Los Angeles the most modern, mobile and magnificent city in the world. A public pedestrian way and open space system that is safe and aesthetic is built because it is part of the workings of the FB circulation system. Single family residential areas are free from traffic cutting through their neighborhoods, and multi-family areas in the FB corridors have the raised pedestrian ways up and out of the traffic. Both of these residential areas benefit from the FB system in preserving a scale of environment that is pedestrian oriented. Next: With the 500,000 new dwellings to be built comes new businesses, shopping, services of all kinds and the institutional buildings communities need. Communities are generating new life. Economic development is massive and citywide. All levels of society benefit. The tax base is lifted immensely. Next: Large scale development can employ new techniques that include existing owners in safe and sophisticated private development corporations with public oversight by the State of California and the Securities Exchange Commission. With these new development corporations the average person participates in the renewal of their community. Non-profits can do this as well. Allowing existing owners to better their own personal estate along with professional and investor participants will open up the 30,000 acres of land for transformation. Gains from the existing owner’s viewpoint are economic participation and obtaining desired product. Gains from the professional view point include economy of scale and the ability to bring innovation. Investors gain benefit from stock appreciation and dividends. Next: The FB corridors make a cleaner environment, -air and water-. Less travel distance per person begins the “cleaner transportation plan”. More efficient and cleaner modes of travel follow through. Automobiles with little stop and go traffic makes less powerful smaller engines burning less fuel practical in traffic flow that is free flowing without congestion. On the other hand, using rapid transit on affordable evolved existing boulevards, in an extensive citywide network, 135 miles of it being exclusive bus lanes, gives the urbanite mobility without auto use. At some point, a technology change can be expected where pollution is not a drawback to vehicular use. At that time there would be pedestrian free freeways and FB’s as “guideways” that can receive very special technology without involving pedestrians. There would be less impact on the urban ecology due to polluted water. The environment has been a filter and a dumping place that is getting clogged and breaking down ecologies to a level that threatens our own lives as well as other species and their habitat. With a major amount of housing, revamped communities and evolved infrastructure, new systems can be employed to clean and direct water appropriately. Water conservation by use of native plant landscaping, instead of the many thirsty green lawns in LA, becomes a “new resource” for human water needs. Clean water runoff heals the bay and the aquifer. Stopping sprawl preserves land and the more densely populated city form conserves a multitude of resources that in turn brings forth affordable human developmental amenities to our many neighborhoods. So, if you are new to the FB concept, at this point it might be good to hop over to the Introduction section. Or if you have read the introduction, then go to the FB2006 section. Getting an understanding of the small and large scale concepts will then prepare you for some of the nut and bolt issues contained in the following. - This plan is derived from the SCAG 2030 projection. The Southern California Association of Governments, our regional planning authority projects a population growth generally of 38% over the next 30 or so years. The majority of this population growth (60 to 70 percent) is due to “organic causes”, people having children and people living longer. The remaining percentage of growth is due to people moving here because it is a good place to live or at least a better place than where they are coming from. The mission at hand is to provide for this growth in an intelligent way, an affordable way and a way that embraces our social ideals adding up to a magnificent city. A few numbers are in order. Los Angeles has approximately 3.2 million people within its city limits not counting many other cities that are in and next to LA’s boundary and functions as LA does. Thirty eight percent of 3.2 million is 1.2 million, the additional amount of people in LA by 2035. Since there is a high percentage of single family homes and not much room to put more single family detached homes, the majority of new buildings will be multi-family buildings. At a ratio of 2.4 persons per dwelling it can be expected that 500,000 new dwellings will be needed for the 1.2 million addition people. Retirees and empty nesters moving to new dwellings, young families moving to older single family homes with yards and every other type of people making adjustments in housing imaginable will be taking place. With 3.2 and 1.2 making 4.3million people needing to get around Los Angeles; -if you are talking housing you must also be talking about transportation -! Los Angeles already has the most notorious traffic congestion in the nation, so this means transportation is going to be a significant determinant of where housing goes as well as being a necessary citywide network with improved capacity. It is a big problem and a big opportunity. It is an opportunity to build a magnificent city with vital neighborhoods and be able to correct all kinds of environmental, social and economic ills. At this point a basic description of the FB Network and its relationship to land use will be focused upon. Some back of the envelope design parameters will be set forth to describe magnitude. Other sections of this website embrace socio-economic subjects more directly. In the FB development corridors assume medium density housing density on average. In the corridor development the housing is mixed with commercial, institutional and other land uses. The assumed proportion, in the immediate corridor vicinity is 1/3rd commercial and other, mixed with 2/3rd housing. This close-in mix of land use will be called the FB “core” land use. A further allocation is the FB “adjacent” category, simply defined as housing land use near the flow boulevard. A final category is the “dispersed” new housing land use which is unrelated to corridor development. 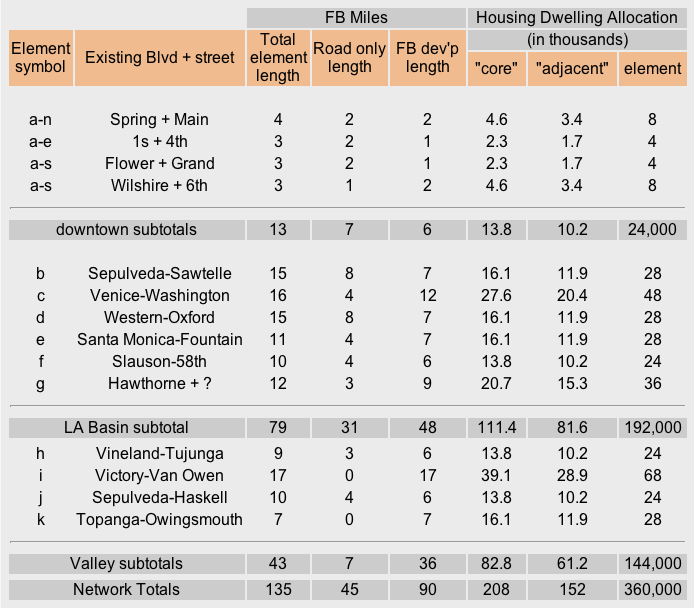 The assumed allocation of the 500,000 new dwellings needed in Los Angeles is on a proportion of 2/5’s “core” and either 2/5’s or 1/5 “adjacent” with a similar allocation for “dispersed” given that particular corridor. On average 2/5’s core plus 2/5 + 1/5 divided by 2 equals 2/5 +3/10’s or 7/10’s times 500,000 dwellings equaling 350,000 new dwellings in the FB corridors on average. More often than not I would say the 2/5’s adjacent would be the case so to bump up the total for the core and adjacent combo to 360,000 dwellings is not unreasonable. The proposed network of 135 miles separates into two categories; 1/ road only development in areas such as going through the Sepulveda pass, and 2/ the FB development corridor where you have housing and other development, -the typical FB corridor -. “Road only” is about 38 miles of the 135 miles with 97 miles being the remainder. Many areas already have medium density housing built up. Acknowledging this fact, the 97 mile portion will be reduced to 90 miles of expected new housing along the FB development corridor network. On the chart of network elements below you can see the total of 90 miles in the FB “developed length” column, and the various reductions made on each element of the network. Ninety miles divided into the 360,000 new dwellings allocated to FB corridors is 4000 dwellings per mile on average. It is important to note that it would be these 4000 new dwellings per mile along with the new commercial and other land uses that evolves the traffic improvement aspects of the Flow Boulevard through its stages. Now on a typical existing somewhat busy boulevard you may have a capacity of 700 vehicles per lane per hour. For the first stage of the FB you can expect the capacity to jump to 1200 vehicles per lane per hour, the second FB stage would be in the 1700 vehicle range and the third stage, which is continuous flow, would be in the 2300 vehicles per lane per hour capacity. It is like making the boulevard to have three times the width of the existing street without doing so. The basic FB is projected to have two flowing lanes and one exclusive bus lane in each direction (some corridors would have more flowing lanes). The exclusive bus lane can likewise have more and more buses as the FB stages evolve. The increased vehicular capacity is achieved by the development of the elevated pedestrian circulation system separate from the street level operations, and by eliminating vehicular cross traffic. To better understand the stages of the FB system, read the How the Boulevard Works section, the Western Ave FB section and the Flow Boulevard 2006 section in that order. Using good urban design principles of interrelating land use growth with improving vehicular capacity, the two work together building the FB stages of increased capacity and the built environment with more housing, land use and better pedestrian environment. As you can see, by building neighborhoods you make traffic flow ! The following chart roughly allocates the number of new dwellings to be expected along the FB corridors and communities. Later, after the chart and a bit further below, are written comments about each FB element corridor. Notes: 1/ The Downtown elements should be called “spurs” and the housing allocation is doubled there. 2/ Road only FB areas are without new housing in areas such as mountain passes, industrial, commercial, LA river or existing medium density housing areas to remain. 3/ Valley housing numbers are reduced by the amount the downtown area housing was increased. To visualize the number of new dwellings on a neighborhood scale is the next task. This will be achieved by translating the allocated numbers into the normal measure of –dwellings per acre-. The length of the corridors is set, so roughly what are the widths of these new neighborhoods? Breaking down the additional 4000 new dwellings per mile goes like this. There are approximately 25 square acres per mile placed end to end. This gives approximately 160 new dwellings every 208 feet (the length of one side of a square acre) along the flow boulevard. Assume there are single family dwellings at a 5 dwelling per acre density that are making way for the new multi-family buildings. So a low medium density of 25 dwellings per acre, less the 5 dwellings per acre making way, equals 20 new additional dwellings per acre. One hundred sixty dwellings, divided by twenty per acre, equals eight acres of width to accommodate the new additional housing. A high medium density of 55 dwellings/acre, less 5/acre equals 50 added, divided into 160 equals 3.2 acres of width to accommodate the 160 dwellings of additional housing allocated for the 208 foot length of FB. Average medium density would be 40 dwellings/acre, less 5/acre, equaling 35 additional then divided into 160 would equal 4.6 acres of width. The chart below starts to help visualization of neighborhoods that could grow along the Flow Boulevard. Obviously there would be all kinds of neighborhood variations throughout the city. In downtown the 160 dwellings could be built on a single acre in a tall building. A cluster of such high rise buildings could evolve as “dispersed” dwellings happened to end up there making a high rise neighborhood. Another likely variation type would be a neighborhood perpendicular to the FB developed along a major elevated pedestrian way combined with grade level pedestrian way extensions on either end. These neighborhoods might occur on some logical module along the FB, such as a quarter mile, to take out the need for traffic signals that here to for let pedestrians get from one side to the other. Variety of configuration and density would occur with various existing street pattern and land use features such as major shopping or recreation for example. Topographic features giving views or even sun orientation could be a determinant for neighborhood form. Availability of land due to prior land use development will most certainly affect the form of new neighborhoods, as well as economic considerations, -the ability to pay for construction types. Another variation is time. Most everything changes with time. The following segment deals with identifying each element of the LA City FB Network. These are preliminary corridors used to express the practicality, need and viability of the FB concept. The case for such a network is being built and it is getting stronger with each area of investigation and expression. Each element of the network would go through a complete planning and urban design process to discern appropriateness of the corridor and its particulars. Many, many new techniques and disciplines are involved with this new city building. They will need development as well. The “a” Elements: The “a” elements (north, east, south and west) are FB “spurs” to better serve downtown. A spur is not a normal Flow Boulevard, essentially due to its shortness. In the case of downtown, the spur is meant to relieve freeway congestion around downtown and to serve the destination of traffic to downtown more directly. The “a-s” (south) spur will intercept traffic before it gets to the congested 10 freeway interchange and feed the traffic directly to the city core. The FB spurs, a-n and a-e, are meant to provide additional north and east capacity for traffic destined to downtown. These facilities may extend in the future as new close-in neighborhoods serving downtown. The a-n spur can link up with the Huntington drive corridor possibly working towards a FB Network forming in the County. The a-e spur would link up into East LA and do the same. The a-w spur to the west will better serve the existing and future growth of the commercial area along Wilshire. I am most familiar with this corridor because I originally proposed it in 1973. There is discussion on my initial Wilshire FB proposal in the section “About Phil Brown” and mentions the resulting Western –Oxford FB alignment that Cal Hamilton put on the Wilshire Center Community Plan in 1975. Evolving higher capacity facilities from existing streets to allow further land use development is one objective. Another is to assure adequate future regional access to downtown. Development of spurs and the FB’s around downtown have a significant relationship to the freeway system. They, the spurs and FB’s, will provide the needed greater regional access required by downtown that will come with future regional population growth. Here again, the idea of getting what can be called local traffic off of freeways will allow the regional traffic facility, -the freeway system-, room for future growth of regional long trip traffic. This is essential because there will be no more new freeways in the downtown area. The “b” element: This is the Sepulveda FB south of the Santa Monica Mountains. South of Mulholland Dr. a widened Sepulveda Blvd. would take the north and south traffic flow. South of Ohio the normal one way pair FB operation begins. First by pairing with Cotner St. and then with Sawtelle further south. The Sepulveda FB is one of the “initial” proposed corridors due to the need for north south congestion relief on the west side. A full preliminary look at the corridor is made with plans and photos in section FB 2006. The “c” element: The Venice-Washington FB from downtown to west of the 405. This in another “initial” corridor and the description is also found in section FB 2006. The “d” element: Of the “initial” corridors, the Western Avenue corridor may very well be the first of all of them. This is the corridor where Cal Hamilton paired Western and Oxford Ave (major and secondary highways) on the Wilshire Center Community Plan in 1975. In the section Western Avenue FB, the description of how the FB would start and then “grow” in length is made. 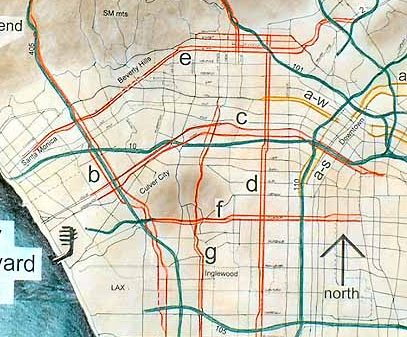 The Western FB is intended to be built from the 101 (Hollywood Freeway) to the 105 (Century Freeway) over time. The “e” element: Element “e” is the old route 2 alignment and as well the deleted Beverly Hills Freeway segment of the planned freeway grid. Obviously this is an “A” list political quagmire. The current Santa Monica Parkway improvement going from the 405 to the Beverly Hills City line would be the western end of a FB corridor. The eastern end would begin by coming off of the Glendale Freeway at or before the LA River. A pair of one way streets through the River Park and Silver Lake area (probably the Hyperion Ave – Griffith Park Blvd alignment) would need the be developed. Substantial housing, River Park and community development would be needed to establish that portion of the FB. That paired segment would then connect with Santa Monica Blvd. and Fountain Ave as a pair. With very few alignment difficulties to La Cienega Blvd. then the quagmire begins. In this case a narrow un-paired alignment is presented. This segment also treated as a “parkway” could begin the corridor evolution. Quite possibly the “e” element will be a lower capacity corridor for many years to come due to these various discontinuities. But at least some segments would perform well and additional housing and community amenities would develop. The final difficult segment is through Beverly Hills (maybe this is where the tunnel experiment is made). Generally the objective is to develop three lanes, one exclusive bus with two free flowing lanes, in each direction from Glendale to beyond the 405 freeway. This is a very active area, currently quite congested and has had high demand for years. Route 2 is an important corridor and long range planning is essential to lessen impacts. This is clearly a place where you want to plan ahead even if it is only in an abstract “visionary” kind of way so as to put individuals and communities on notice. The “f” element: Again this is an original Caltrans freeway alignment that was never built, -the Slauson Freeway-. In a FB configuration the pair would be Slauson Blvd and 58th (street or place). Starting at the 90 freeway in the west, the freeway would transform into a FB through the southern portion of the Baldwin Hills and then align with the Slauson – 58th FB corridor. The Slauson FB would proceed east beyond the 110 (harbor Freeway), past the “LA River Regional Park” and in to a hopefully reinvigorated industrial-technology park. As in all segments of the FB Network the various elements and segments of elements develop on a -where needed as needed- basis evolving through the various stages. Pent up traffic demand is one kind of need and housing combined with community development is another that creates its own traffic demand. As these two needs and pressures emerge, then likewise the FB system of elements emerge and form a network. The “g” element: Another difficult corridor comprised of discontinuities, -the Hawthorne Boulevard corridor-. As time goes on, and communities learn to develop with Flow Boulevards, it will be known what is difficult and what is not. The corridor looks difficult now simply because there are not two wide parallel streets separated by a single block. What looks difficult now may not be in the future. There are many variables beyond traffic and housing demand mentioned above, (including age of and type of housing stock). Maybe the route discontinuities that are presented, where higher capacity segments connected to low capacity segments, do not present constriction if adequate cross traffic capacity is attained. It may depend on that particular segment, its traffic demand along the corridor and ones ability to read the GPS maps in the car (and you can figure more technological help in the future). What could be a very plausible situation, and it should be expected, is that a high capacity segment is desired and is developed for its own sake. It would be like an island in the pattern of lower capacity development. As with today on small project development, mitigation of potential traffic snarls would be part of the development, simply on a larger scale. My expectation would be that projects would beget projects while logic and good planning would guide the desired construct of an overall integrated system that works efficiently together. The “h” element: Starting in the Cahuenga Pass, in a freeway adjacent location, then connecting with Vineland –Tujunga the corridor would proceed north to the Sunland area. The major and secondary highways in the Valley are on a half mile grid. So Vineland (a major) and Tujunga (a secondary) Avenues are a half mile apart essentially going through residential areas. This brings up a traffic operation issue that I call “turn around and go back”. This operation occurs when you proceed along the FB and stop at a particular land use, say shopping, then you probably want to “turn around and go back” where you came from. A FB with the one way pair separated by a single block, “turn around and go back” is made rather directly. If the pair is separated by a distance of a half mile, -it’s not so direct-. I think the “turn around and go back” function should be direct in commercial FB corridors, but I think residential corridors present a different case where wider separation can be acceptable. In your commercial corridor, the large traffic attractor would even ideally be in the block between the FB pair. In and out, arrivals and “turn around and go backs” are made directly, even within the commercial attractor itself. Smaller attractors would occur on the outside locations along the corridor, using the streets connecting the one way pair to “turn around and go back”. The residential areas are different because the attractions, single family residences or even multi-family dwellings, have few visitor demands and are spread out at that. The main traffic function of the FB corridor, in this case, is to move large volumes of people along to some destination “out there” (the bedroom community). Proposed medium density residential building up on the FB would, however, start to build a case for fairly direct “turn around and go back” capability. The local and larger streets between the separated FB pair would need to be analyzed for that capability. One consideration that could be used in the Vineland – Tujunga half mile separation is to build multi-family density between the pair. This kind of neighborhood would have a one way pair of local streets of its own connecting to the FB directly. That would produce appropriate “turn around and go back” function. 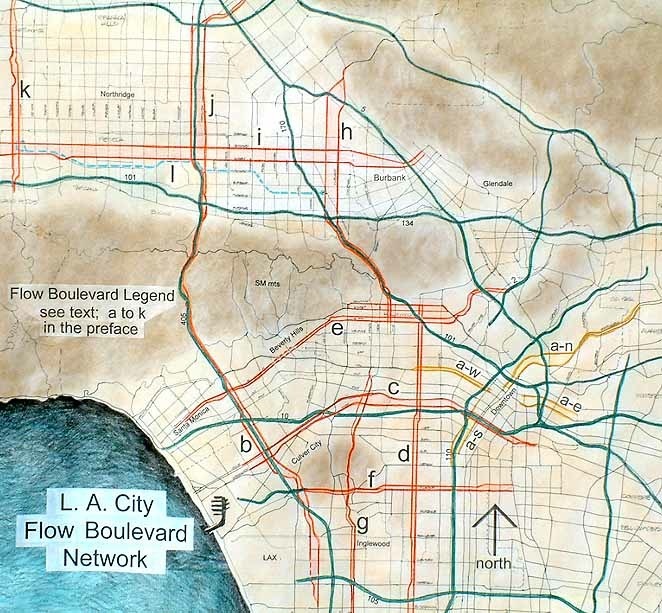 If you are getting familiar with the Flow Boulevard concept, you are starting to see that this is a major concept in city building for Los Angeles. This is not just a 30 year plan to accept a 38% boost in population it is a structure for growth that can take Los Angeles well into the Twenty First century. Not all things will work out perfectly as expected. But as in the case of the four deleted freeways in the Caltrans original grid something more appropriate will evolve, as in this case -Flow Boulevards- to fill in the gaps that occur. Innovation and creativity abounds, just give it the opportunity. There are answers to the “turn around and go back” kind of issue that may not at first seem to be ideal but then turn out to be quite good. The “i” element: This is the Victory Blvd. and Van Owen St. corridor. Both of these are major highways and again are separated by a distance of one half mile. This is similar to the Vineland – Tujunga corridor, but different in that there are a number of small manufacturing, auto repair and like businesses there with low attraction traffic numbers. Another aspect of the Valley street organization is that traffic signals can be synchronized for two way traffic. At half mile intervals between major streets and often no other signals closer than a quarter mile apart this falls within the timing capability. When signals are closer than a quarter mile, they end up favoring one direction or another. What this means is that if the corridor did not change much it could remain in a “preliminary” FB state. On the other hand, if development was in demand a likely place for it would be between the Victory and Van Owen streets. In this case, at some point traffic demand would point towards the two streets to become a FB one way pair. The corridor is a good one in that it goes from one end of the Valley to the other. From that stand point, it may be desirable to encourage early development of a FB corridor. The 101 flowing into the 134 to the south of this corridor is nearly to the limit of traffic carrying capability. The “j” element: The Sepulveda Blvd. corridor on the Valley side is element “j”. Increasing capacity in the Sepulveda – 405 connection between West Los Angeles and the Valley is essential for future growth. Five lanes each way and a HOV (high occupancy vehicle) lane makes six lanes of width each way. This is the freeway conventional limit (mainly for safety reasons). For the needed additional capacity, I propose the FB as a facility operating separately from the 405, with the typical three addition lanes (rapid bus exclusive lane and two free flowing lanes) running to the sides of the existing 405 freeway. Note that the “j” element is the northerly continuation of the “b” element north of Mulholland Drive. In the pass north of Mulholland the FB would probably be partially cut into the hillside and partially on structure to make the tight fit next to the 405. Once out of the hills the alignment would be on Sepulveda Blvd. and a new road along the eastern side of the 405 that would align with Haskell Avenue north of Victory Boulevard. The corridor would then continue north to Rinaldi Street. The Haskell Ave. right of way in many segments does not have adequate width for the basic three lanes and the usual merging lanes that make the FB perform appropriately. Therefore major upward zoning would be used in combination with block – corporation large land aggregation, to reorganize the area. Having a freeway between the FB pair of streets would present problems and opportunities. One opportunity is that long freeway trips and short FB trips can exchange easily from one to another. The problem would be that with a freeway between the FB pair it may bring difficulty in tying together FB operations. Specifically the “turn around and go back” operation. The resolution may be that the FB would be looked at as a distribution and pick-up corridor. In other words mainly a traffic oriented corridor responding to the commuting functions between the Valley and West LA. The development function adjacent to the FB would be diminished so as not to have major land use attractors with major “turn around and go back” operations and the like. This is probably an important idea to recognize. The FB corridor can be customized to different performance standards given the particular place in the Network. The FB is not a freeway governed by 70 mile per hour design requirements and being a limited access facility without relationships to adjacent land use. The FB is designed for 40 mile per hour operation, could have a large variety of adjacent land uses and types of connections effecting the FB operations. As an example, look at the two initial corridors, The Western Ave and the Venice – Washington FB’s. They look and would operate very differently. Custom look and operation would probably occur in most every FB corridor. The “k” element: This is the Topanga Blvd – Owingsmouth Ave. proposed FB corridor that would connect between the 101 and the 118 freeways in the west valley. Similar development conditions as Vineland – Tujunga FB would prevail. An actual FB one way pair operation may not develop for some time. It would remain as a pre – FB corridor until which time traffic demand and density warranted the switch. The “l” element: This is the light blue line shown on the Network plan. It is the MTA “orange line” exclusive bus lane facility. It exists about half way from the North Hollywood beginning (and end of the Metro subway line), to its eventual end at the Warner Center terminus in the west valley. Bus stops are on about half mile separations. Minor stimulation of land use development can be expected around what is a revived light rail line alignment (originally part of the Pacific Electric system?). The line is said to have good ridership, which would stand to reason in that it is fed by the Metro heavy rail line. I like the fact that buses were used for this line because they are flexible and can turn off on to surface streets to link up with other lines and vice versa. Therefore the orange line can be made to integrate with the proposed FB rapid bus lanes as well. The final points to be stressed, is that the FB Rapid Bus Network is very much needed. To be able to traverse LA in a reasonable amount of time with public transit is basic to “getting LA to work”. That the system would be affordable and the facility that makes population growth possible in LA separates this city building approach from all others. It would rid LA of congestion on surface streets and the freeway system. It brings desirable new neighborhoods and safe public open space throughout LA. No other city building approach can make all those things happen so that Los Angeles becomes that magnificent city it deserves to be.